“Candide has been injured by some falling masonry; he was stretched out in the street, covered with rubble. He was calling out to Pangloss: ‘Help! Get me some oil and wine; I am dying.’ ‘But these earthquakes are nothing new, replied Pangloss. ‘The city of Lima in America experienced the same tremors the last year; same causes; same effects; there must certainly be a seam of sulphur running underground from Lima to Lisbon.”(from Candide, p.14). The quoted chapter seems contemporary. It resonates with every disaster experience in the world today. There is always a sense of disbelief and shock. And yet it clear that there have always been preceding disasters which offered lessons we may or may not have learned. Looking back, we realise that the Lisbon disaster was significantly smaller than many disasters since. 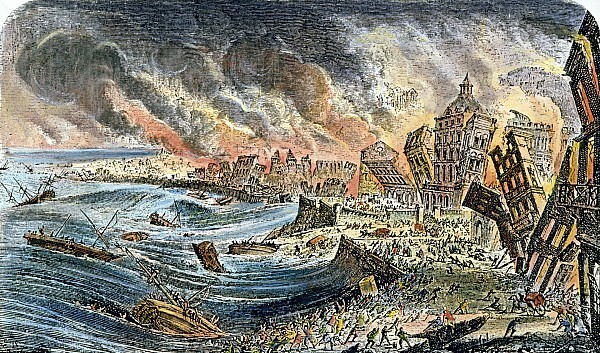 The Central China floods in the 1800s, and more recent Pacific 2004 Boxing Day Tsunami came with a manyfold greater death toll, and yet the sociological shift of the scale post the Lisbon disaster did not repeat itself. The two world wars of the twentieth century have perhaps dented our human capacity to be surprised at large scales of destruction. Perhaps, in today’s global world, nothing is ‘too much’ any longer. The above article is an excerpt from When We Stopped Eating Bananas, an e-book reflecting on disaster resilience since Tropical Cyclone Larry. It is available now on Amazon.